On this countdown the ‘template’ word has already appeared on a number of occasions. This Admiral shirt design is another one of those, a template. No disrespect to Eintracht Frankfurt, Dundee, Saudi Arabia, Vancouver Whitecaps or even Coventry City who actually had it first (even in their infamous shade of russet), but this is probably the most recognisable. 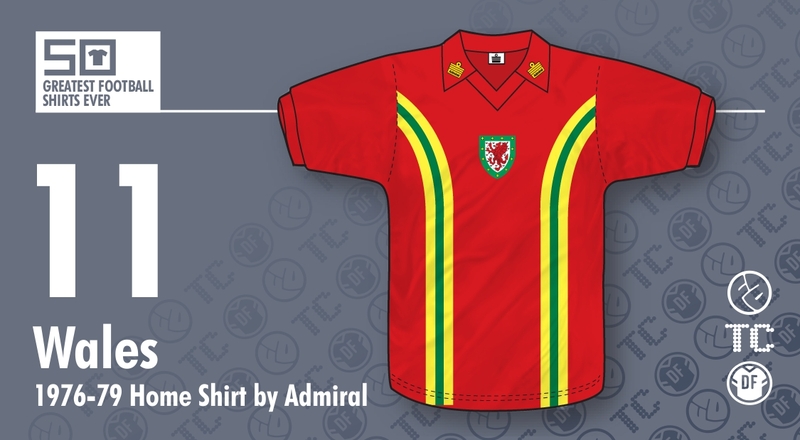 The FAW joined the pioneering shirt designer’s revolution in 1976, just as the replica shirt market started to really take off, donning the same iconic Admiral ‘tramlines’ design until the end of the decade. The colour combination of all red with the two arched ‘tramlines’ stripes in yellow and green, from the shoulders vertically down each side of the shirt’s front, was perfect for a Wales shirt. What separated this one from others in this template was the Welsh dragon crest placed centrally on the chest. The Admiral logo had to be moved onto the winged collar, meaning they could use two, and this appeared to give the shirt more of a balanced look. Remember the tramlines were even more enhanced by the fact they continued down the front of the matching red shorts. A great colour combination for a Wales shirt, although I'm not quite sure about Admiral’s marketing explanation for the colours. ‘Red for the dragon’, yes... ‘yellow, for the daffodil - Wales’ national flower’, yes ok... ‘green for the leek, the national vegetable’... Seriously!!! Not totally necessary justification for an 11-year-old - after all, Wales away colours were traditionally yellow with a green trim and I don’t think Umbro use of those colours’ would have been explained in quite the same way in 1949. The away kit of this design was another beauty, a reverse of home in the traditional daffodil yellow with tramlines in red and green. By the mid-Seventies, the Welsh national football team were enjoying a bit of a purple patch, the only one of the home nations to qualify for the quarter finals of the 1976 European Championships and a controversial failure to qualify for Argentina ’78 World Cup due to the hand of Jordan. It was a great time to wear your replica Admiral Wales shirt with pride, although it was also a time when it was deemed semi-acceptable to see non-Welsh kids wearing the shirt, such was its appeal. In the late Seventies - and early Eighties, if you’re English - Admiral replica shirts carried the same status that, later, a pair of Jordan Air Max did. You weren't really fazed by the scratchy, itchy, small electric shock of the nylon material or the fact that your previously shiny vinyl crest and logos cracked and peeled after Mum washed it for the umpteenth time. Wind forward 25 years from when I first held a cotton player’s shirt in my hand and imagine my joy in finding out these also came in an aertex perforated hole variety... it was nearly too much to take! The cloth crest, logos and numbers stitched to the shirt were a work of art and that buzz, even today, is still the same. If you missed the Seventies replica shirt boom, you probably don’t really get all the fuss made about Admiral Sportswear, but for those that were there, many are now iconic classic shirt designs. For me and many other Welshmen, the Wigston factory in Leicestershire produced the finest Wales shirt of all time. Our grateful thanks to Simon 'Shakey' Shakeshaft. He can be followed on Twitter here and his website, Wales Match Shirts, contains everything you need to immerse yourself in the wearable history of Yorath, Giggs, Southall and many, many more.